How to successfully manage patients with diabetes during cataract surgery. • Given the increasing prevalence of diabetes and rise in the number of cataract procedures performed each year, literature aimed at managing both conditions concomitantly is lacking. • In the past there was concern that the inflammation associated with cataract surgery could lead to a breakdown of the blood-retina barrier, with release of inflammatory cytokines that could subsequently worsen DR and DME. • Although no clear guidelines exist for the treatment of patients with DR and DME at the time of cataract surgery, modern phacoemulsification techniques, combined with appropriately employed pharmacologic agents and vigilant retina care, can afford patients the best possible outcomes. Somewhat surprisingly, the intersection of cataract surgery and DR is not as well delineated as would be expected, and there has been surprisingly little cross-pollination between physician researchers who make a living in the anterior chamber and those who deal with the back of the eye. A review of the literature uncovers a dearth of prospective trials that provide guidance on the treatment of DR and diabetic macular edema (DME) in the perioperative period surrounding cataract surgery. Another limitation is the lack of a clear distinction between DME and pseudophakic cystoid macular edema. This article offers our insights into caring for patients with diabetes who require additional care from our anterior segment colleagues. There is even less clarity regarding the timing and treatment of patients with preexisting DME in the perioperative period. Effective treatments for DME in the setting of cataract surgery include focal laser, topical steroids or nonsteroidal antiinflammatory drugs (NSAIDs), periocular steroid injections, intravitreal steroid injections, and anti-VEGF injections.10 As is often the case when there is a plethora of treatment options, there is no universally accepted best treatment option for patients with DME who require cataract surgery. There is information to be gleaned from data from the phase 3 RIDE and RISE trials examining ranibizumab (Lucentis; Genentech) treatment in patients with DME.11 There was no increase in the frequency of cataract surgery in patients receiving ranibizumab compared with those receiving sham injections. Among patients who underwent cataract surgery during the first 2 years of the studies, cataract removal was performed at approximately the same time for both sham and ranibizumab-treated study eyes (on average, around month 12). Furthermore, patients who received ranibizumab treatment for DME during the RISE and RIDE trials and did have cataract surgery did not experience worsening of vision. 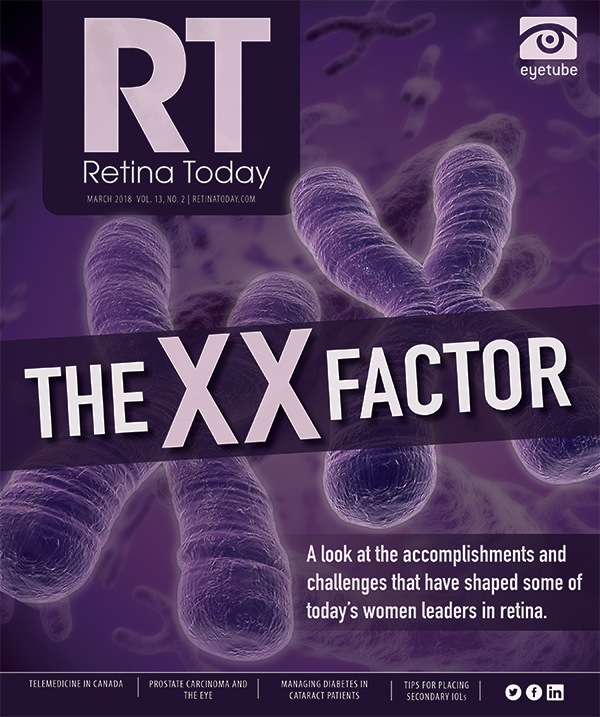 Similarly, the 148-week results of the VIVID and VISTA trials showed that aflibercept (Eylea; Regeneron) injections for the treatment of DME were associated with minimal cataract formation and minimal need for cataract surgery.12 Thus, as opposed to the known association of higher rates of cataract formation with intravitreal corticosteroid therapy for DME, anti-VEGF therapy with ranibizumab or aflibercept does not appear to increase cataract progression. Additionally, a post hoc analysis of data from the FAME study related to the fluocinolone acetonide intravitreal implant 0.19 mg (Iluvien; Alimera Sciences) for DME in the setting of cataract surgery has been completed.22 In most patients who underwent cataract surgery after injection of the implant, there was a net gain in vision from preoperative baseline and from original study baseline. Thus, the addition of NSAIDs to the cataract drop regimen can be considered, especially in patients with DR or DME. If there are identifiable extrafoveal microaneurysms causing localized clinically relevant edema, focal laser can be considered. However, if the macular edema is center-involving, then anti-VEGF agents seem to be well tolerated preoperatively, intraoperatively, and postoperatively. Intravitreal injection of corticosteroids is also a reasonable option, especially for patients without clinically significant intraocular pressure rises with past steroid exposure. Intravitreal steroid injections have the added benefit of increased duration of efficacy in the perioperative period. DR and DME need not be absolute contraindications to performing cataract surgery when clinically indicated. Distinct guidelines are lacking regarding an optimal treatment strategy for patients with DR and/or DME who require cataract surgery. Nonetheless, the prevalence of diabetes continues to increase, and we will see increasing interplay between these two areas of eye care. Modern phacoemulsification techniques, combined with appropriately employed pharmacologic agents and vigilant retinal care, can afford patients with diabetes the best possible visual and anatomic surgical outcomes. 1. Boyle JP, Thompson TJ, Gregg EW, Barker LE, Williamson DF. Projection of the year 2050 burden of diabetes in the US adult population: dynamic modeling of incidence, mortality, and prediabetes prevalence. Popul Health Metr. 2010;8:29. 2. Schein OD, Cassard SD, Tielsch JM, Gower EW. Cataract surgery among Medicare beneficiaries. Ophthalmic Epidemiol. 2012;19(5):257-264. 3. World Health Organization. Causes of blindness and visual impairment. www.who.int/blindness/causes/en/. Accessed February 2, 2018. 4. Klein BE, Klein R, Lee KE. Diabetes, cardiovascular disease, selected cardiovascular disease risk factors, and the 5-year incidence of age-related cataract and progression of lens opacities: the Beaver Dam Eye Study. Am J Ophthalmol. 1998;126(6):782-790. 5. Krupsky S, Zalish M, Oliver M, Pollack A. Anterior segment complications in diabetic patients following extracapsular cataract extraction and posterior chamber intraocular lens implantation. Ophthalmic Surg. 1991;22(9):526-530. 6. Pollack A, Dotan S, Oliver M. Progression of diabetic retinopathy after cataract extraction. Br J Ophthalmol. 1991;75(9):547-551. 7. Squirrell D, Bhola R, Bush J, Winder S. Talbot JF. A prospective, case controlled study of the natural history of diabetic retinopathy and maculopathy after uncomplicated phacoemulsification cataract surgery in patients with type 2 diabetes. Br J Ophthalmol. 2002;86(5):565-571. 8. Romero-Aroca P, Fernández-Ballart J, Almena-Garcia M, Méndez-Marin I, Salvat-Serra M, Buil-Calvo JA. Nonproliferative diabetic retinopathy and macular edema progression after phacoemulsification: prospective study. J Cataract Refract Surg. 2006;32(9):1438-1444. 9. Chu CJ, Johnston RL, Buscombe C, Sallam AB, Mohamed Q, Yang YC; the United Kingdom Pseudophakic Macular Edema Study Group. Risk factors and incidence of macular edema after cataract surgery: a database study of 81984 eyes. Ophthalmology. 2016;123(2):316-323. 10. Boscia F, Giancipoli E, D’Amico Ricci G, Pinna A. Management of macular oedema in diabetic patients undergoing cataract surgery. Curr Opin Ophthalmol. 2017;28(1):23-28. 11. Moshfeghi AA, Shapiro H, Lemmon LA, Gune S. Impact of cataract surgery during treatment with ranibizumab in patients with diabetic macular edema. Ophthalmology Retina. 2018;2(2):86-90. 12. Heier JS, Korobelnik JF, Brown DM, et al. Intravitreal aflibercept for diabetic macular edema: 148-week results from the VISTA and VIVID studies. Ophthalmology. 2016;123(11):2376-2385. 13. Udaondo P, Garcia-Pous M, Garcia-Delpech S, Salom D, Diaz-Llopis M. Prophylaxis of macular edema with intravitreal ranibizumab in patients with diabetic retinopathy after cataract surgery: a pilot study. J Ophthalmol. 2011;2011:159436. 14. Chae JB, Joe SG, Yang SJ, et al. Effect of combined cataract surgery and ranibizumab injection in postoperative macular edema in nonproliferative diabetic retinopathy. Retina. 2014;34(1):149-156. 15. Fard MA, Yazdanei Abyane A, Malihi M. Prophylactic intravitreal bevacizumab for diabetic macular edema (thickening) after cataract surgery: prospective randomized study. Eur J Ophthalmol. 2011;21(3):276-281. 16. Takamura Y, Kubo E, Akagi Y. Analysis of the effect of intravitreal bevacizumab injection on diabetic macular edema after cataract surgery. Ophthalmology. 2009;116(6):1151-1157. 17. Lanzagorta-Aresti A, Palacios-Pozo E, Menezo Rozalen JL, Navea-Tejerina A. Prevention of vision loss after cataract surgery in diabetic macular edema with intravitreal bevacizumab: a pilot study. Retina. 2009;29(4):530-535. 18. Lim LL, Morrison JL, Constantinou M, et al. Diabetic macular edema at the time of cataract surgery trial: a prospective, randomized clinical trial of intravitreous bevacizumab versus triamcinolone in patients with diabetic macular oedema at the time of cataract surgery - preliminary 6 month results. Clin Exp Ophthalmol. 2016;44(4):233-242. 19. Furino C, Boscia F, Niro A, et al. Combined phacoemulsification and intravitreal dexamethasone implant (Ozurdex) in diabetic patients with coexisting cataract and diabetic macular edema. J Ophthalmol. 2017;2017:4896036. 20. Panozzo GA, Gusson E, Panozzo G, Della Mura G. Dexamethasone intravitreal implant at the time of cataract surgery in eyes with diabetic macular edema. Eur J Ophthalmol. 2017;27(4):433-437. 21. Khurana RN, Appa SN, McCannel CA, et al. Dexamethasone implant anterior chamber migration: risk factors, complications, and management strategies. Ophthalmology. 2014. 121(1):67-71. 22. Yang Y, Bailey C, Holz FG, et al; FAME study group. Long-term outcomes of phakic patients with diabetic macular oedema treated with intravitreal fluocinolone acetonide (FAc) implants. Eye (Lond). 2015;29(9):1173-1780. 23. Kim SJ, Schoenberger SD, Thorne JE, Ehlers JP, Yeh S, Bakri SJ. Topical nonsteroidal anti-inflammatory drugs and cataract surgery: a report by the American Academy of Ophthalmology. Ophthalmology. 2015;122(11):2159-2168. 24. Wielders LH, Lambermont VA, Schouten JS, et al. Prevention of cystoid macular edema after cataract surgery in nondiabetic and diabetic patients: a systematic review and meta-analysis. Am J Ophthalmol. 2015;160(5):968-981.e33. 25. Singh RP, Lehmann R, Martel J, et al. Nepafenac 0.3% after cataract surgery in patients with diabetic retinopathy: results of 2 randomized phase 3 studies. Ophthalmology. 2017;124(6):776-785. 26. Singh RP, Staurenghi G, Pollack A, et al. Efficacy of nepafenac ophthalmic suspension 0.1% in improving clinical outcomes following cataract surgery in patients with diabetes: an analysis of two randomized studies. Clin Ophthalmol. 2017;11:1021-1029.